Once you disembark from Pier 6, your captain takes you to view the Western Harbour before crossing into the lagoons to visit the Toronto Islands. Sites featured include historic Hanlan’s Point, the Island Yacht Club and the woodlands of the Island Bird and Wildlife Sanctuary. The captain and crew provide entertaining and informative narration to highlight the historical significance of the Toronto Islands and the waterfront. During the summer months, the tour makes a brief stop at an island dock where you have the opportunity to disembark to explore the islands at your leisure. When you have finished exploring the islands, simply come back to the dock and wait for the next ship to continue your tour. 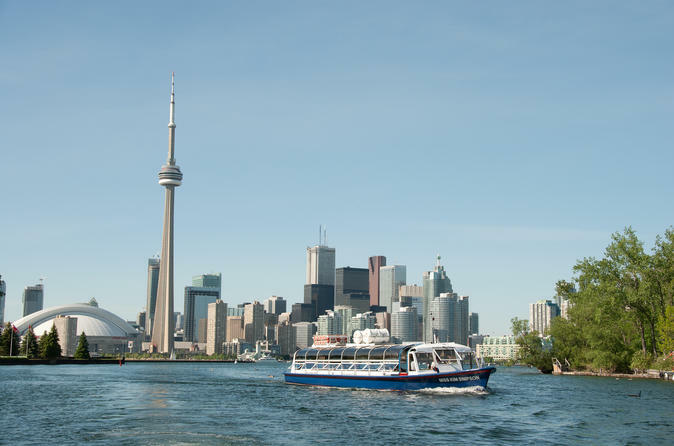 With the second half of the tour, cruise back to Toronto Harbour as the crew tells you about many of the notable buildings that make up the ever-changing skyline, such as the CN Tower and Rogers Centre, while you snap a photograph of Toronto from the boat.